Chris and I have finally returned after a great week back in Silicon Valley showcasing Wufoo at the [Under the Radar Conference](http://undertheradarblog.com) and talking about some of our experiences at [Startup School](http://startupschool.org). Both events were top notch and we want to thank [Dealmaker Media](http://www.dealmakermedia.com/) for inviting us out there for UTR and [Jessica Livingston](http://www.foundersatwork.com/) for putting on such an awesome lineup of speakers at Stanford. We had a ton of fun spreading the word, meeting our users and talking with people about how awesome it is to be making stuff people are excited to use. 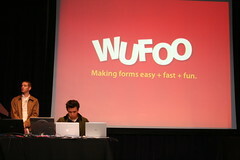 We are also very honored to hear that Wufoo was voted the [best-in-show winner](http://www.undertheradarblog.com/wp_blog.html?fb_2042860_anch=2182860) by the Under the Radar audience, and that the judges voted Wufoo the winner in our presentation category. Many thanks goes out Debbie Landa, Randall Johnson, [Will Price](http://www.humwin.com/team_detail.cfm?ID=10), [Joe Cooper](http://virtualmin.com/) and a ton of others for helping us tweak our presentation at the very end. Apparently, we also get prizes which is extra excellent. Congrats. You guys deserve the accolades. Posted March 28th, 2007 by Anton Zuiker. Is there a video I can stream of your Under the Radar presentation? I attended that conference but had to leave before you guys went on. Posted March 28th, 2007 by Rick Alber. Rick, I don’t believe that there is a stream of that presentation. I remember asking before we went for some audio of previous presentations, and they didn’t have any. I’ll be on the lookout, because I’d like to hear how it sounded also. Posted March 28th, 2007 by Chris Campbell.